by Gary, Susan N.; Borison, Jerome; Cahn, Naomi R.; Monopoli, Paula A. 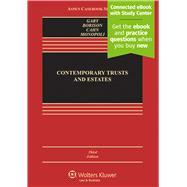 The third edition of Contemporary Trusts and Estates captures the rapid evolution of doctrine in trusts and estates law that has occurred over the past half-century in response to profound societal and demographic changes. Based on recent developments in legal education, this casebook integrates legal analysis, judgment and perspective, ethics, and practice skills. It focuses simultaneously on the theoretical foundations and practical applications of the material, teaching students by using traditional case analysis and, at the professor’s option, innovative exercises.